484 records – page 1 of 25. 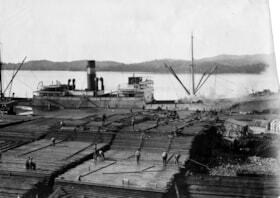 "Bannockburn" unloading at Prince Rupert, B.C. K.G. Polyblank - written in ink on top of box lid - a railway surveyor. E.R. Watts & Son, Surveyor`s and Architects Instruments and Materials. Head Office and Works, 123 Camberwell Rd. London S.E. England. Ottawa 200 Wellington St; 408 Portage Ave Winnipeg. Àll kinds of surveying instruments (by any maker) can be repaired at our Winnipeg Store by experienced workmen trained in our London Works. Used for railroad and highway surveys. Taken from original accession card. Bought for $25 in 1935 and it was 30 years old at that time. Used in Quebec and BC - including the Skeena Region. This is a common surveying instrument. There were only two kinds of levels availabe when the railway cam, to be used in surveying. These were the "Y"level and the dumpy. The level was made by E.R. Watts & Sons, London, England. The level was bought by mother-for-father in 1935 for $25 used. It was 30 years ol then. The previous owner was Polyblank - a railway surveyor. Thomas Edward Clarke was born in Bothwell, Ont. in 1888, came west in 1908. 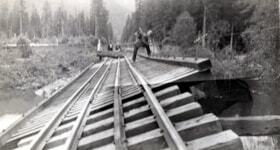 In Edmonton he was hired as Chainman for Garnet Hughts on preliminary location of GTP to Jasper; reached Jasper Christmas 1908. 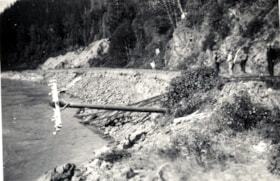 Then he continued surveying until 1960 in different areas of BC In 1926 he was the Assistant District Engineer for Dept. of Public Works in Smithers. The Central Park building was 6 yrs. old then and he had an office on the second floor. The position he had was equivalent to the current position of "Highways Superintendant". (In 1926 conversion had just been made from Horse and wagon to trucks. )He was involved with initial road building in the province. 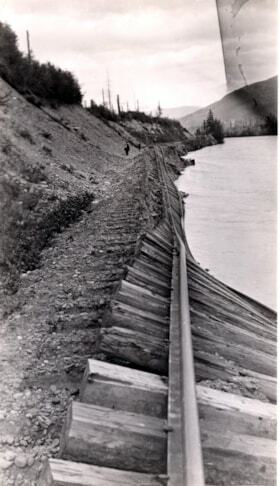 May have been caused by the Skeena River flood in 1936. Item is a booklet of meeting minutes of the Brotherhood of Railroad Trainmen in Smithers, B.C. Item belonged to John Wright. Four metal railroad spikes. There is a flat head that is connected to a four sided body that is thinner at the tip. 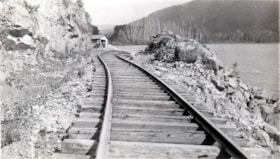 Spikes used on the Smithers railroad. A black spike with rough, hewn marks and an offset head. The spike appears to have been homemade. This item has a long wooden handle like an axe handle, but the steel blade is shaped like a large chisel. There is a thick layer of padding wrapped around the blunt end of the chisel that is a layer of rubber, then a thick canvas, then rubber again. The wood handle is 69cm long. The steel chisel is 25.5cm long. This item was used as a railroad track chisel a long time ago. Note on back: "View of 2000 ft. washout at 7.8 Skeena (? ), and part of shovel crew on their way to Terrace to get grub"
Train tracks that were washed out. A: Light blue metal lantern. The face has two small light bulbs, one is inside a concave circle. There is a metal ring around the outside of the bulbs to protect them. This ring is raised 5cm from the rest of the lantern. The body of the lantern is a blue metal cylinder with a large round handle which is covered with thin rubber. The handle attaches to the lantern at each side of the cylinder. The lantern stands on the metal rings extending from the edge surrounding the bulbs. Inscribed on the blue dome top is a star and the words 'STAR H_A__IGHT LANTERN CO.' 'Tucker' is scratched into the side. B: Large EverReady Waterproof Lantern Battery. A tall round metal container with a smaller tube attached to one side. The larger tube was used by the railroad to store a cap and signal flag for employees to use for incoming trains and has a hinged top. The smaller tube is hollow and welded to the larger one at both top & bottom making it possible to fit over a stake set in the ground. H.L. PIPPER MONTREAL is stamped on one side of the larger tube. Item is now public domain. Ignore stamps on back. Parade from Central Park - Railroad. 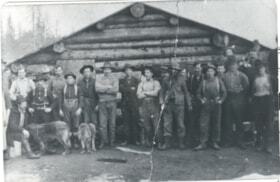 Written on back: "Grand Trunk Pacific Railroad Crew 1908-10 outside bunkhouse. Probably near Bateman Landing. Dogs of Dr. W.P. Johns - need to pack medical supplies to crew\ Taken from original photos of Dr. W.P. Johns"
Fonds includes the meeting minutes of the Canadian Brotherhood of Railroad Employees Div. No. 93 spanning 1926 to 1962. The Canadian Brotherhood of Railroad Employees was first formed in 1908. The Smithers Branch (Div. No. 93) was started in September 22, 1926 and covered members from Endako to New Hazelton. The first meeting was held at the Smithers’ Canadian National Railway Station, where Normal Kilpatrick presided as President, and R.W. Champion as Secretary. Later the Canadian Brotherhood of Railroad Employees became the Canadian Brotherhood of Railway Transport and General Workers. 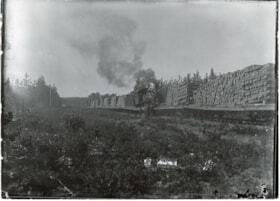 The Smithers Branch existed until 1994 when the Canadian Brotherhood of Railway Transport and General Workers amalgamated with the Union of Canadian Auto Workers. Bolt has a rounded head with threads extending 6.5cm up the bottom. 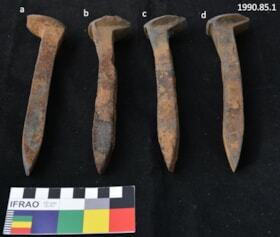 These four railway tie bolts were used on the C.N.R. for connecting rails together.